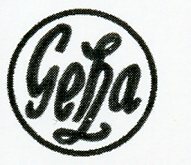 This trademark was originally used by the firm G. C. Dornheim AG in Suhl. 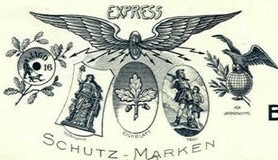 The trademark which originated with the Karl Bauer & Co. in Berlin. 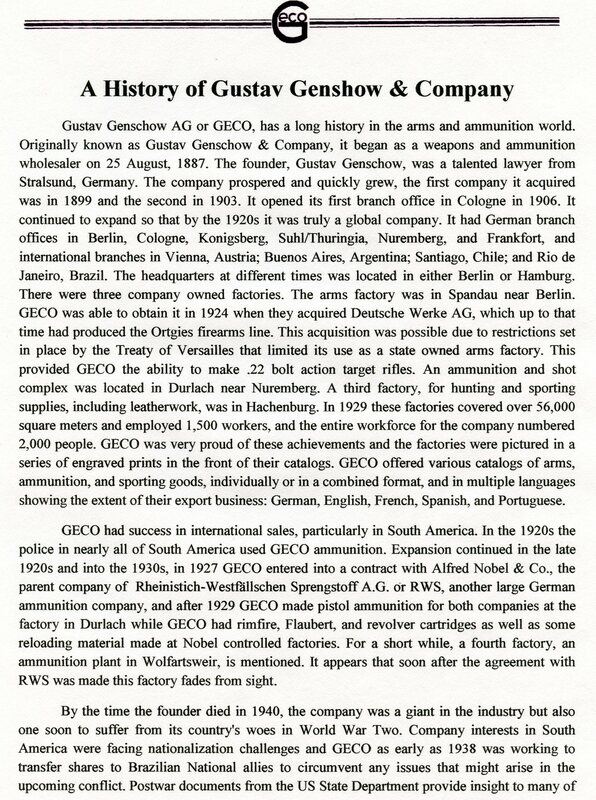 The Logo’s and paragraph above and the following history of the Gustav Genschow Company was written by Mr. Robert L. Adair Jr.and is from his yet unpublished book The Pistols and Holsters of Gustav Genschow & Company. 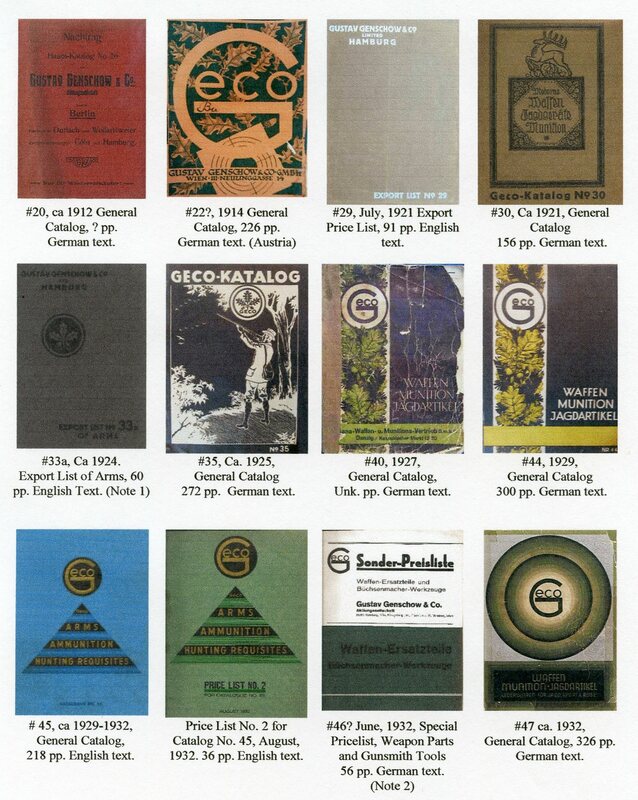 I thank him for his generosity in allowing me to use the material from his book. 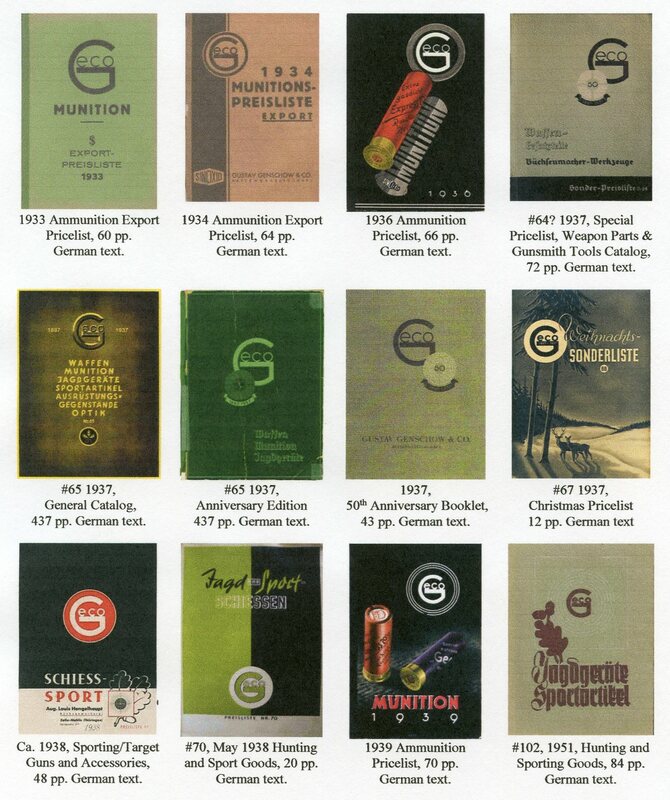 The images below are known Genschow catalog covers with their date and number of issue. 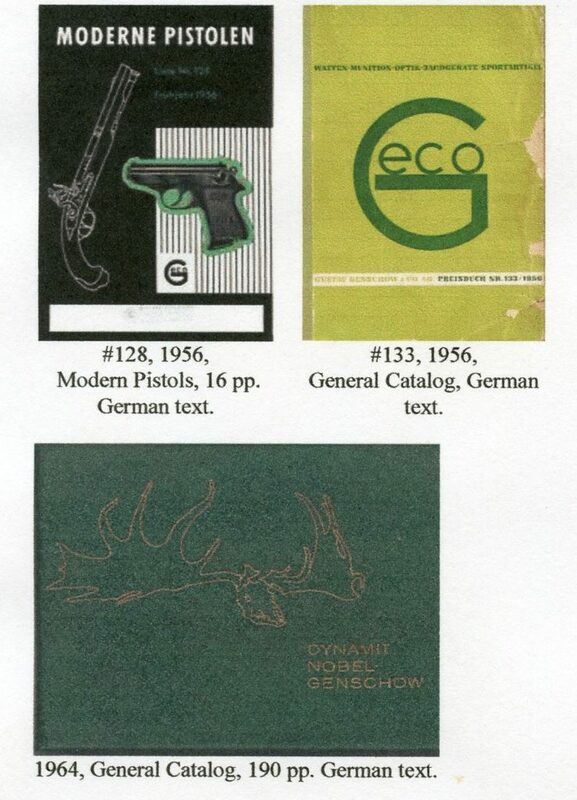 These are also from Mr. Robert L. Adair’s unpublished book and used with his kind permission. 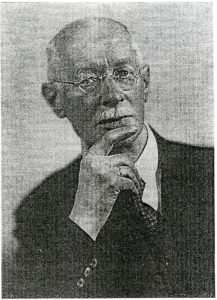 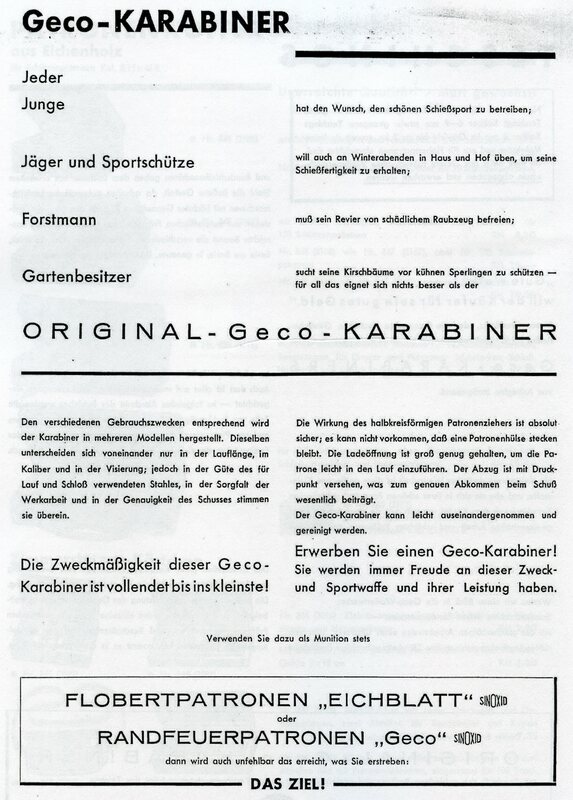 One of the companies acquired by Genschow was G. C. Dornheim AG of Suhl. 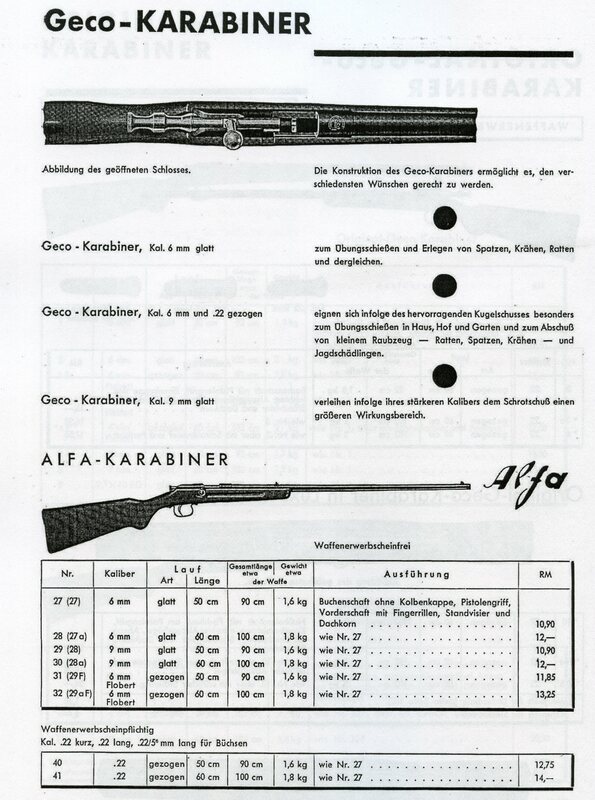 They were a retailer of small arms components and small caliber training rifles. 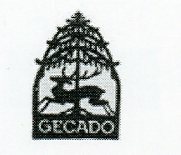 Their trade name was Gecado and they were acquired by Genschow in 1940 which was also the same year that Gustav Genschow passed away. 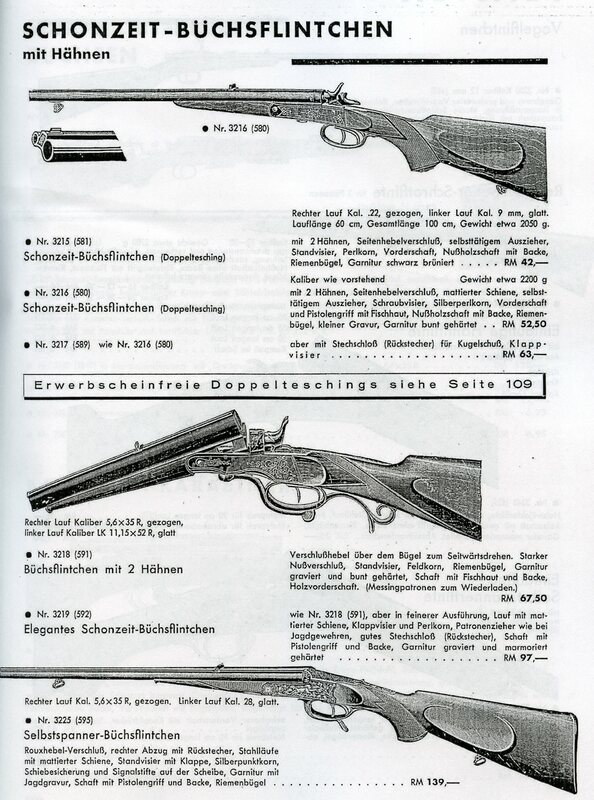 The following Catalog pages come from a 1937 edition which celebrated the companies 50th Anniversary. 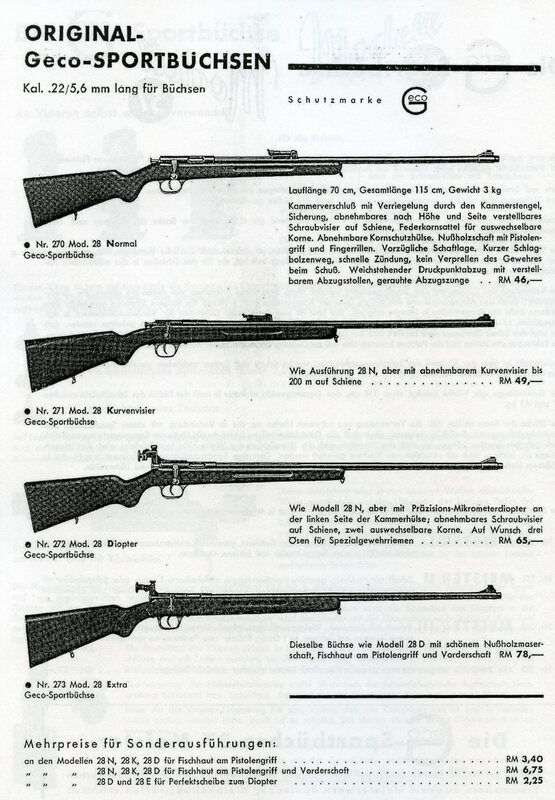 Was the model 37 rifle intrduced that year? 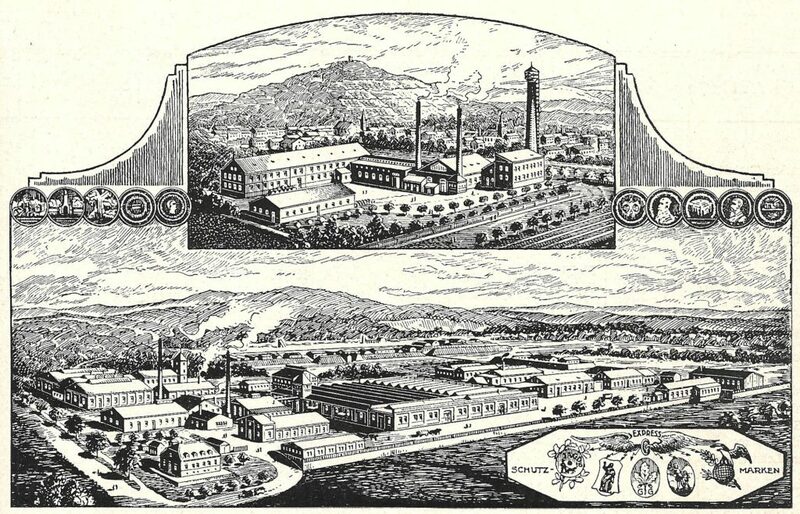 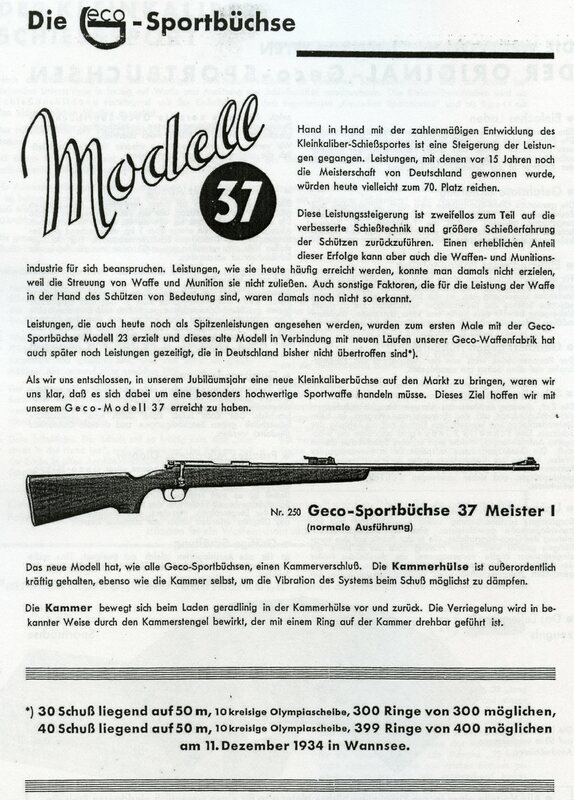 Some sources state that Geco did not make any guns themselves while other sources state that they had gun making facilities in Spandau and Suhl. 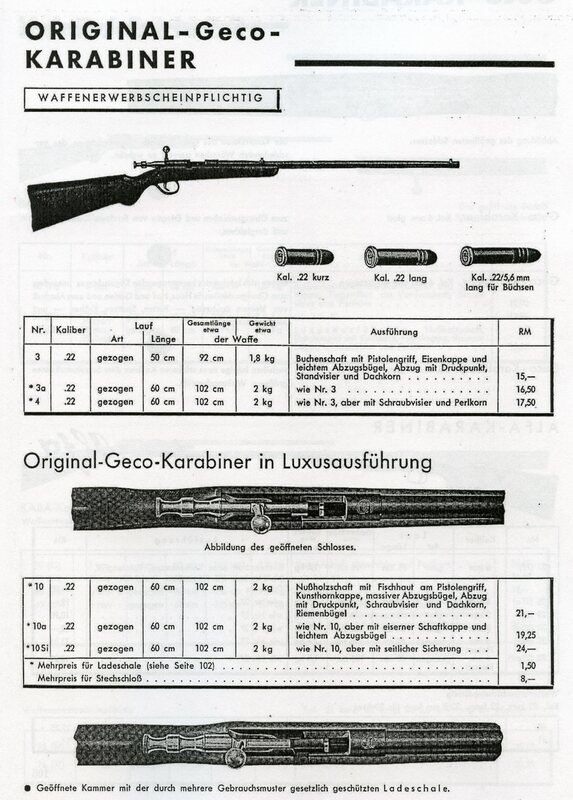 I personally believe that the model 37 and the Geco Karabiner were made by them. 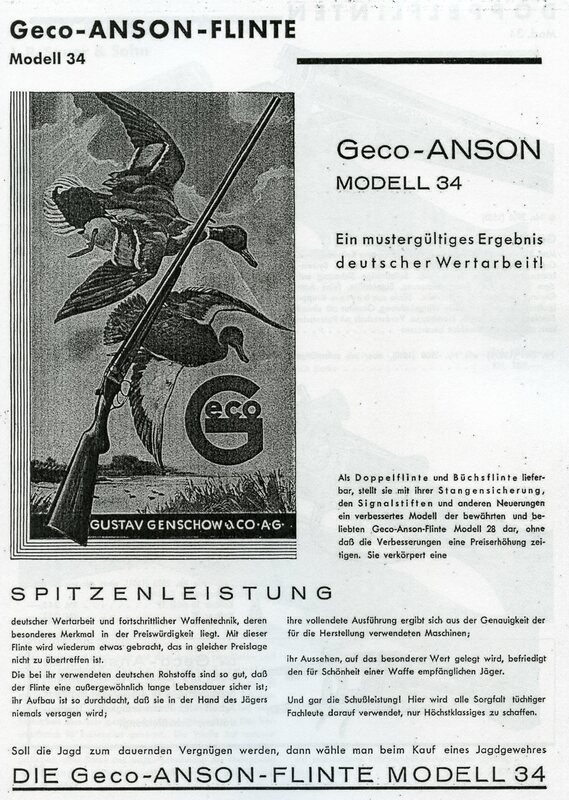 Geco was certainly the Sears & Roebuck of the German Sporting world with facilities making Ammunition, Leather goods, and they sold, imported and exported everything a shooter or sportsman could want or need. 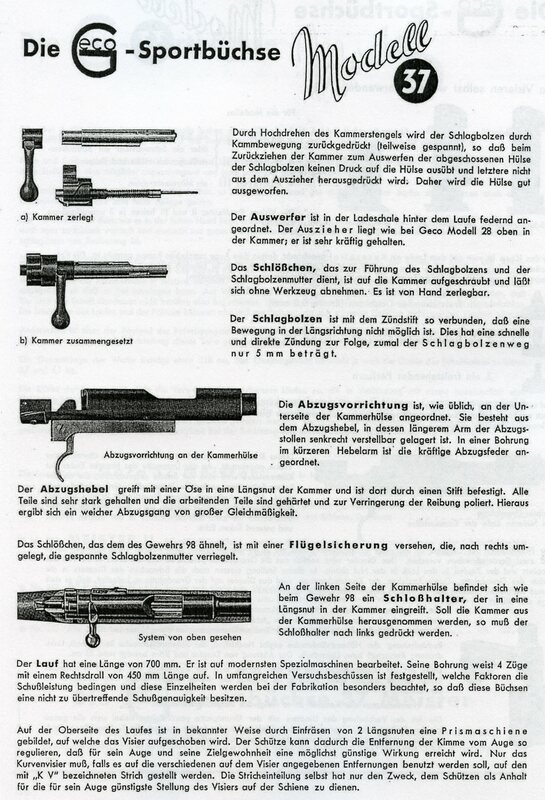 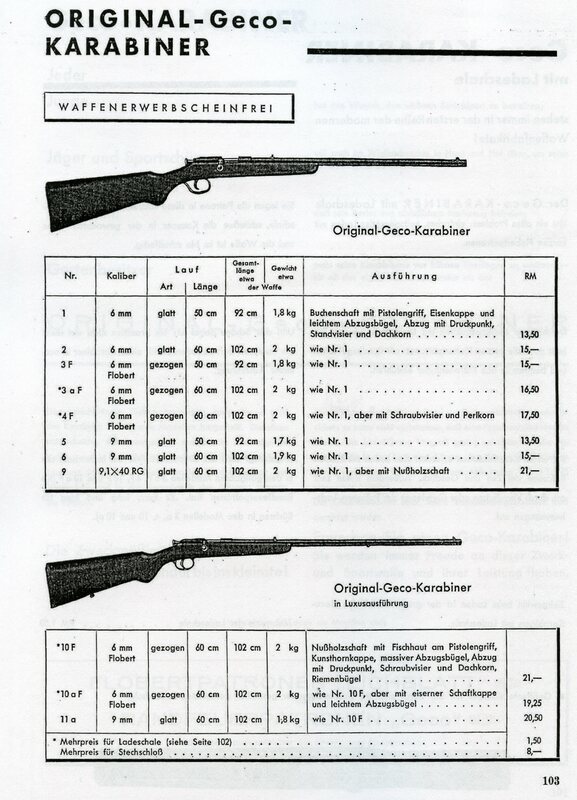 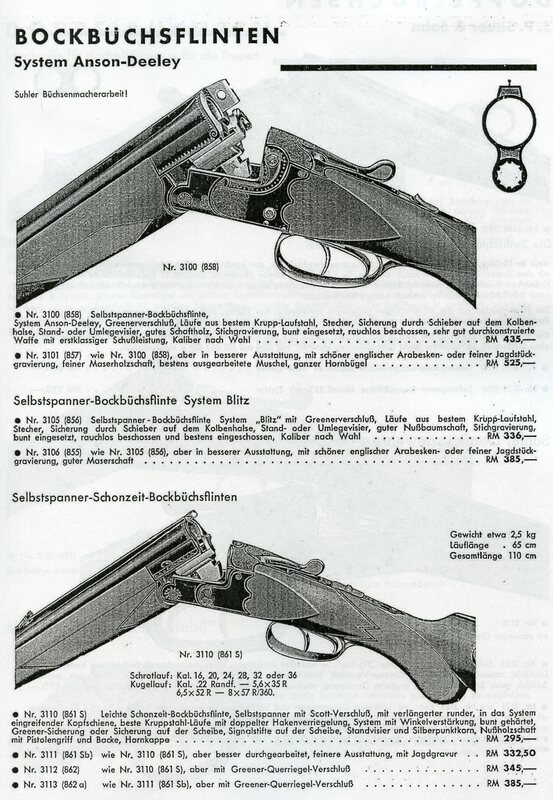 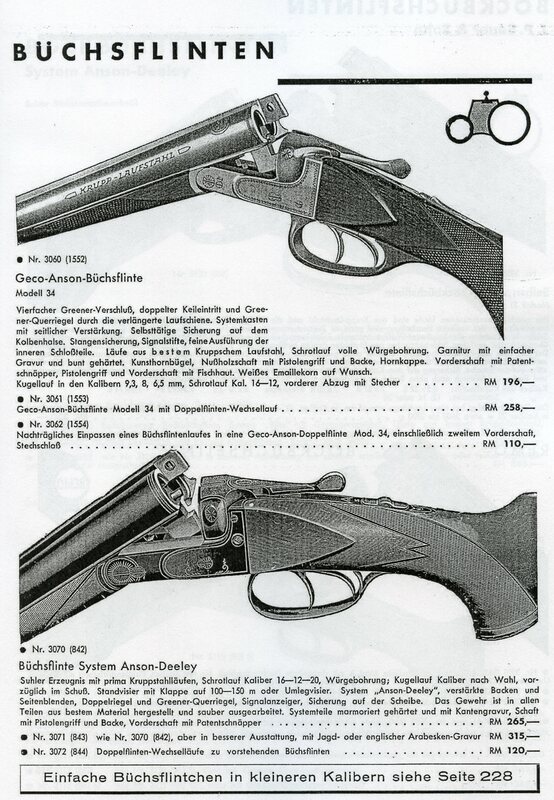 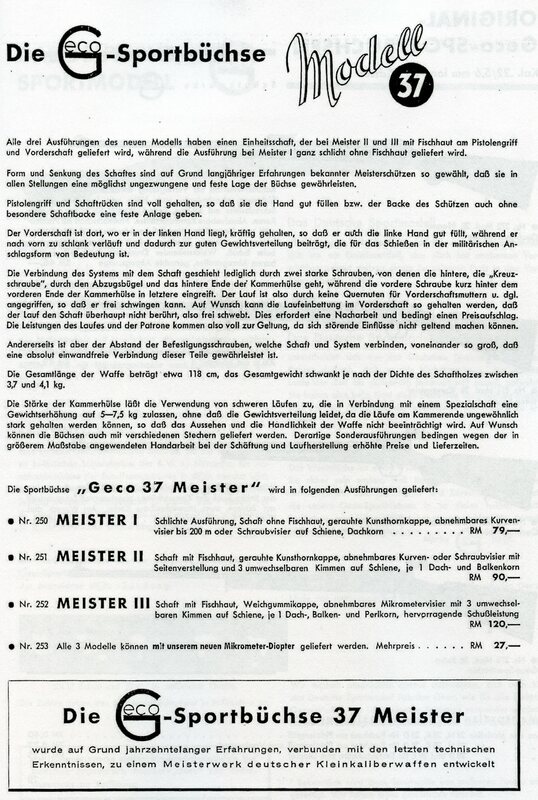 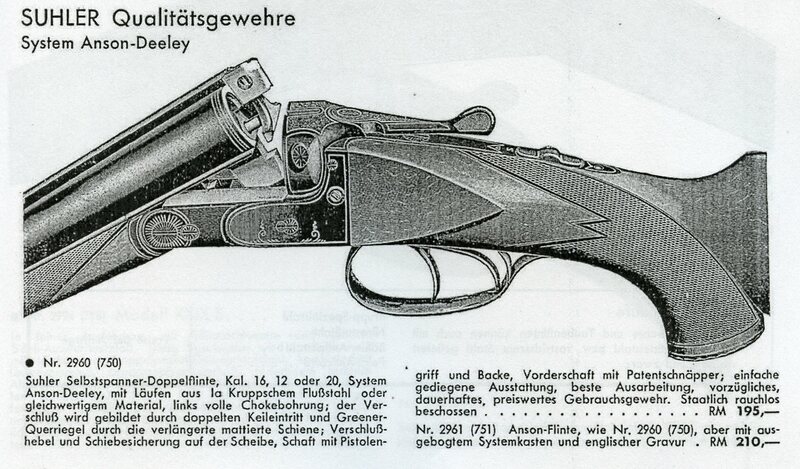 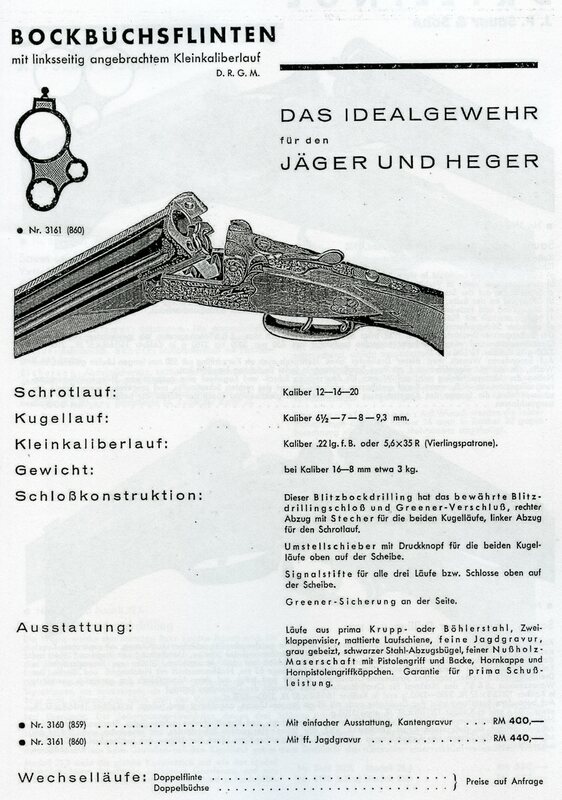 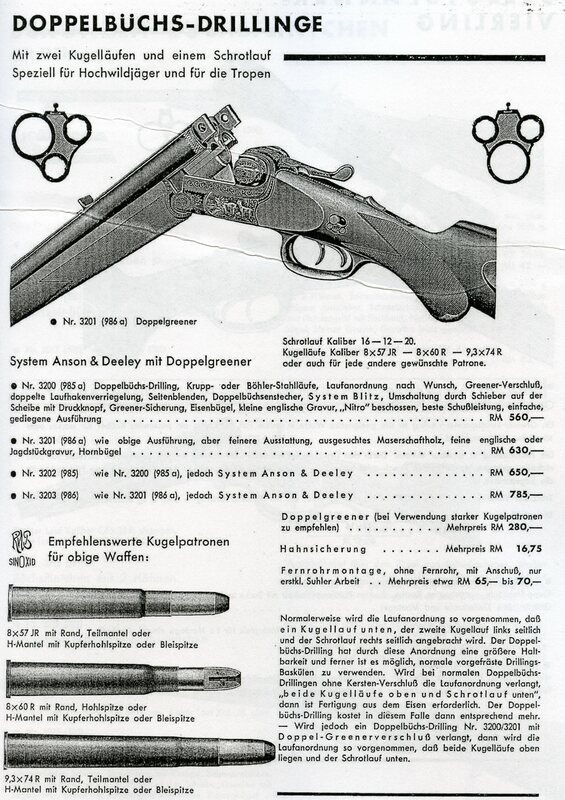 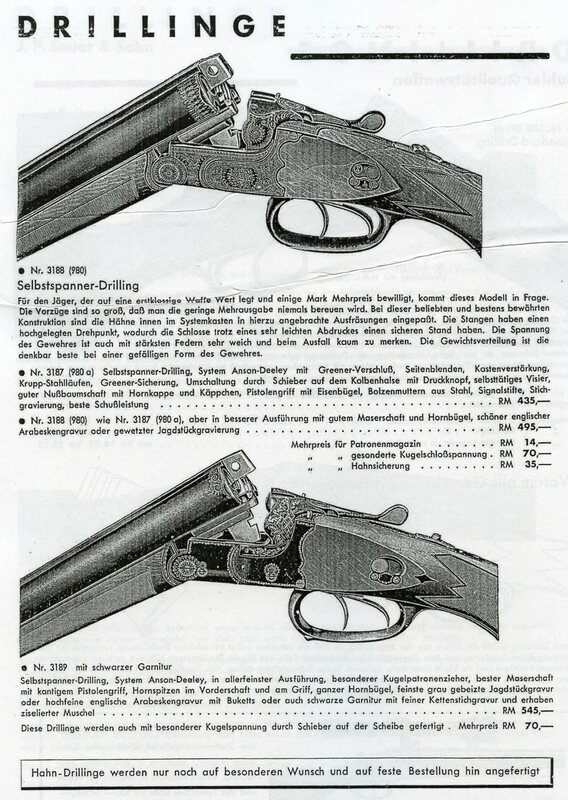 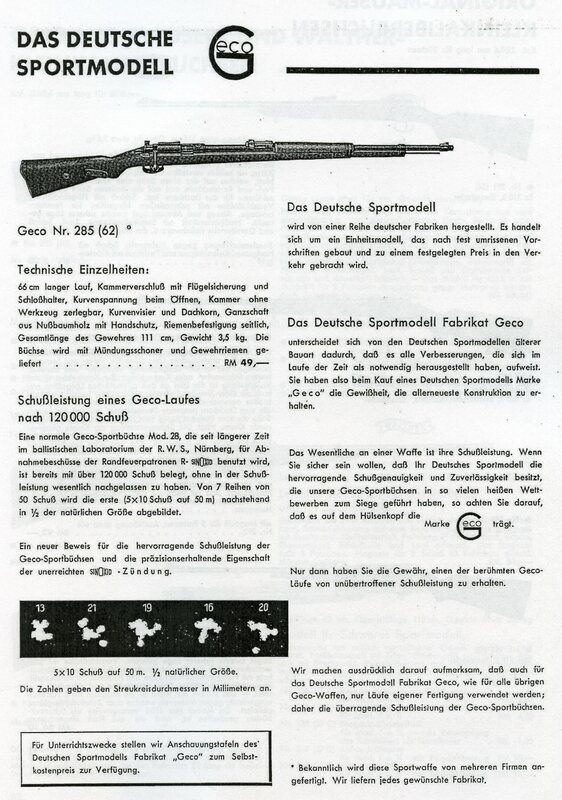 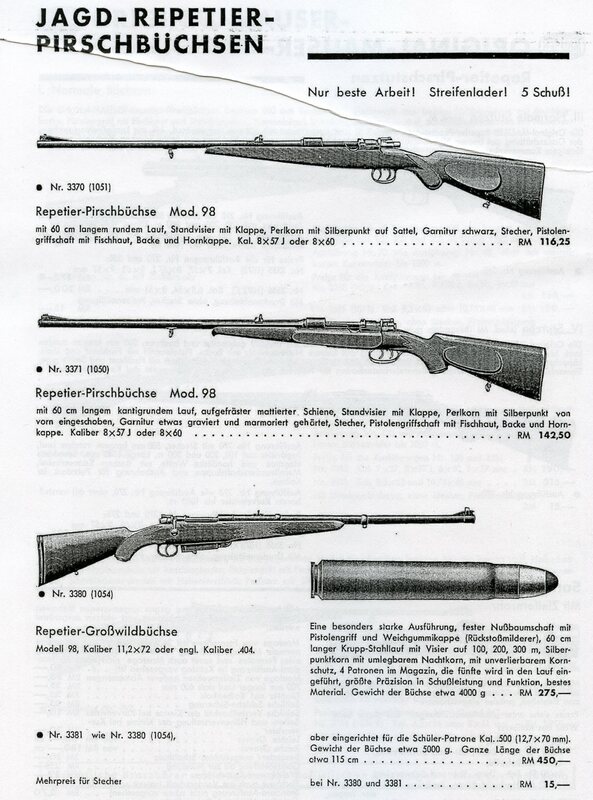 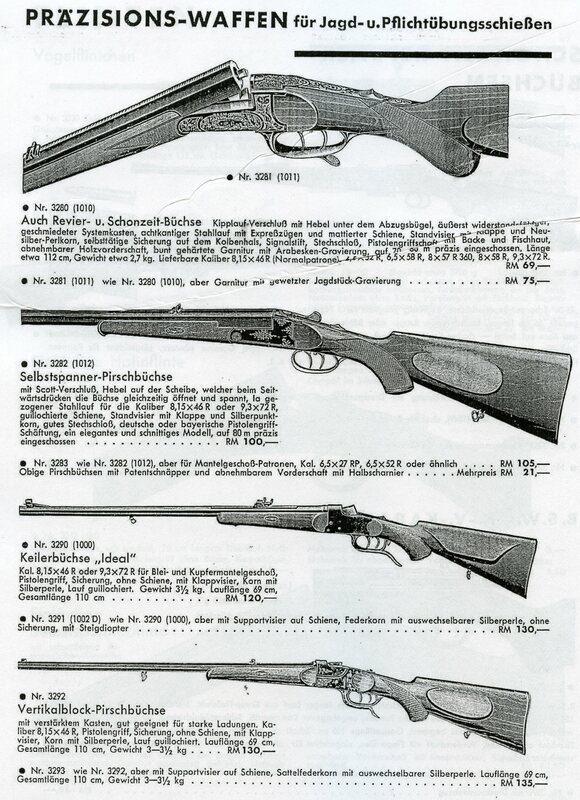 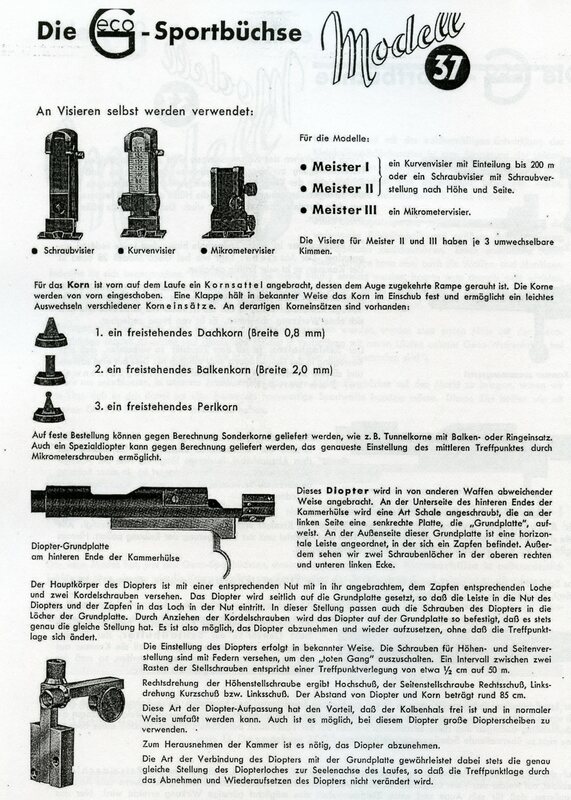 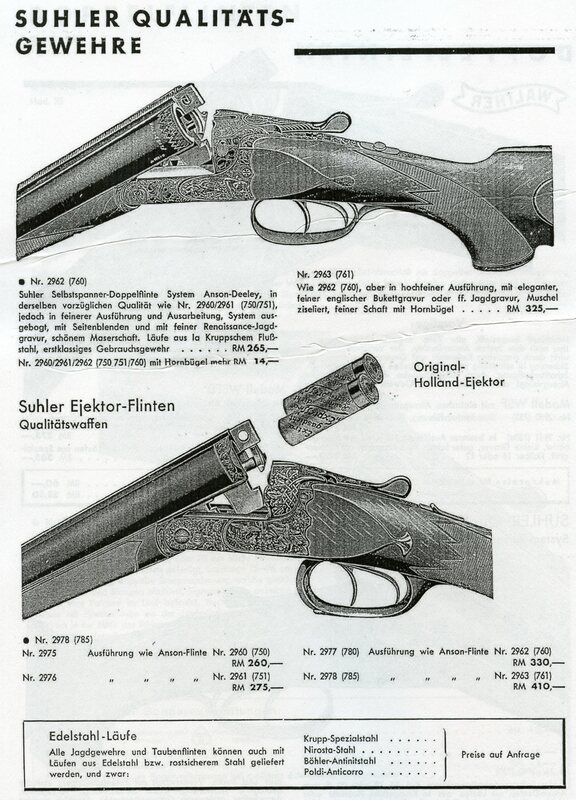 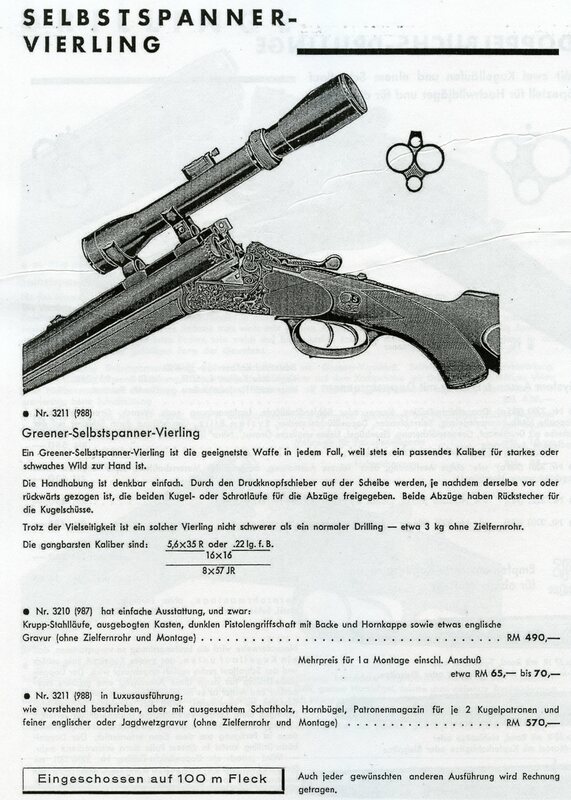 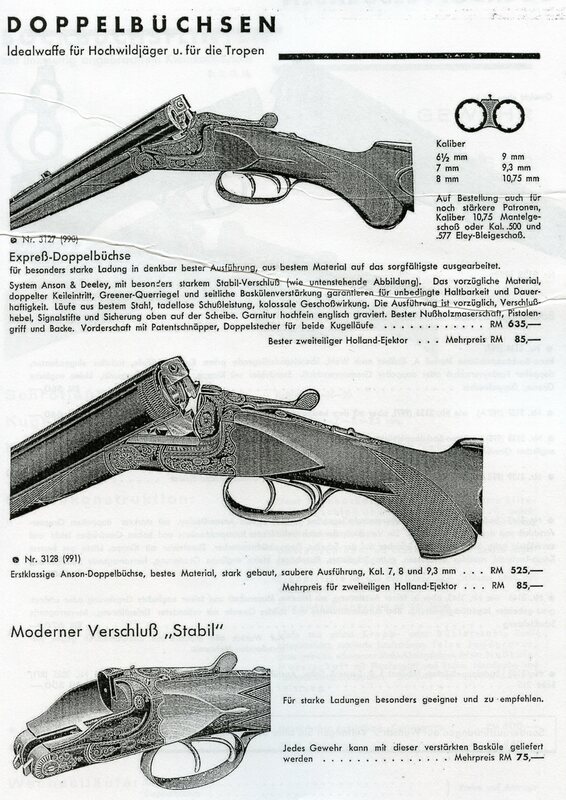 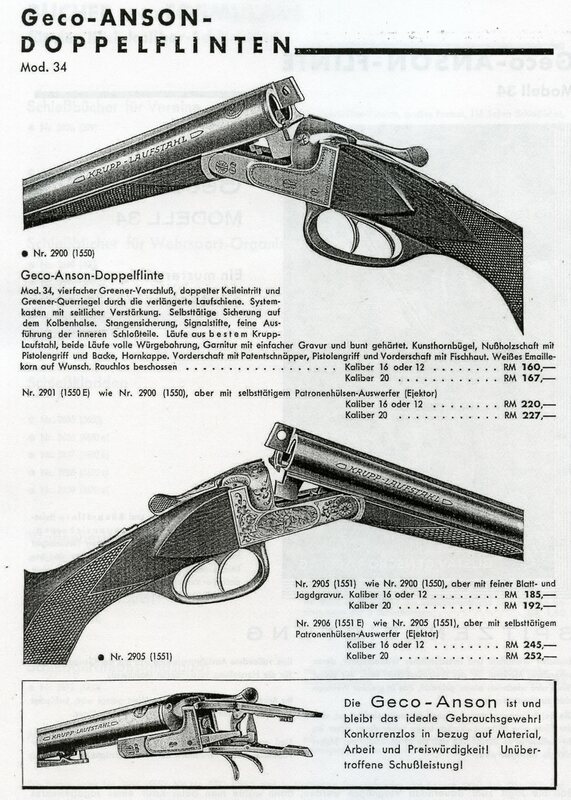 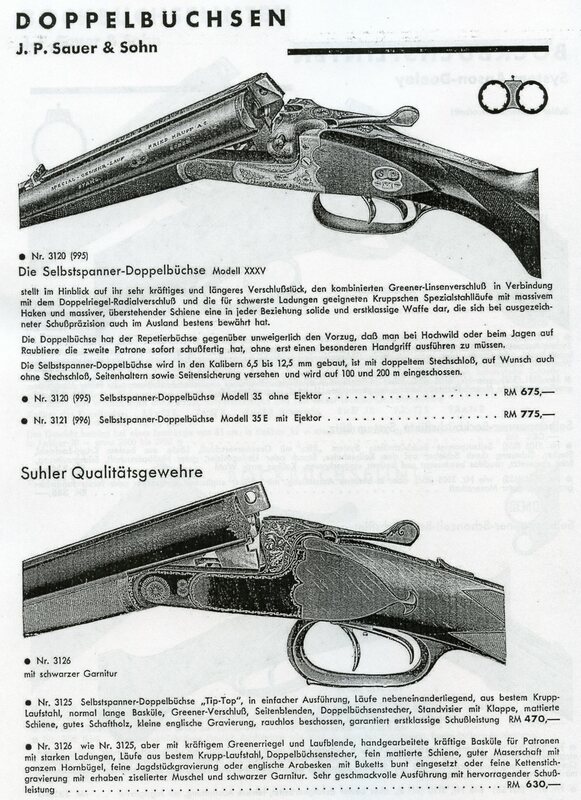 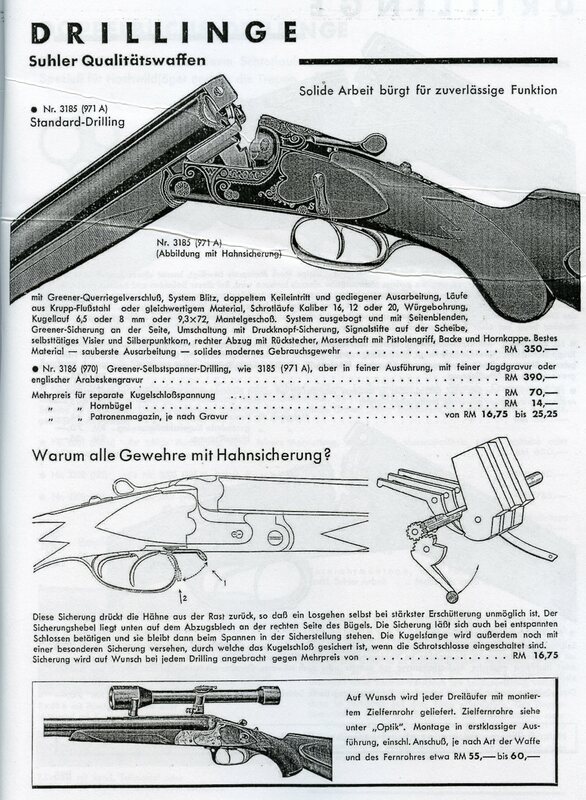 As with the small caliber bolt action rifles labeled “Geco” the 1937 Catalog also shows break action multi barrel guns labeled “Geco” and “SUHLER Qualitätsgewehre”. 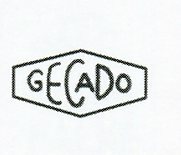 It is my belief that the guns labeled “Geco” were made by the Company. 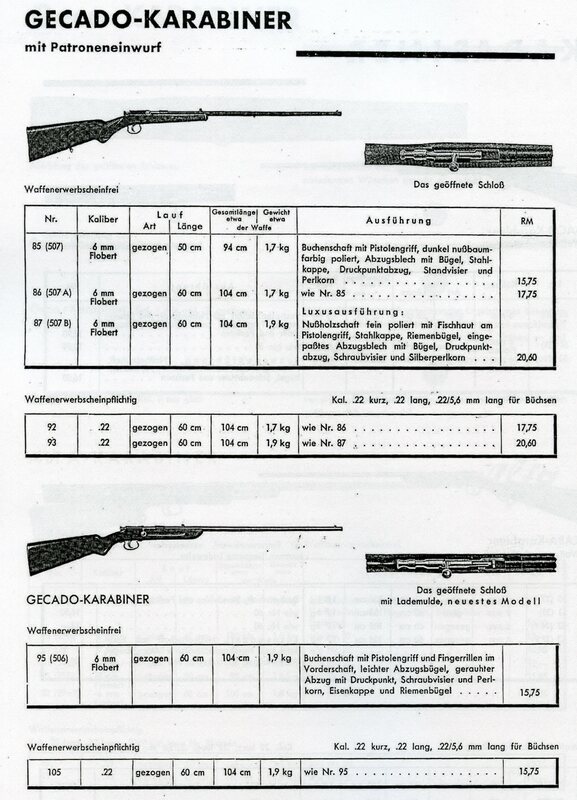 Perhaps the “SUHLER Qualitätsgewhre” guns were made for Geco by a firm such as the Gebr. 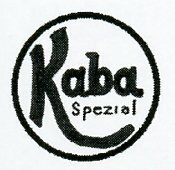 Adamy or Gebr. 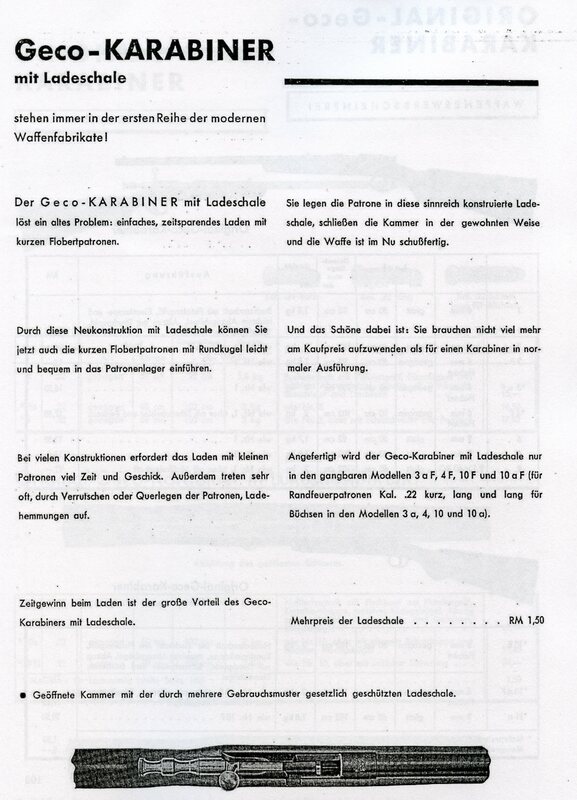 Heym with whom they had some form of business arrangement. 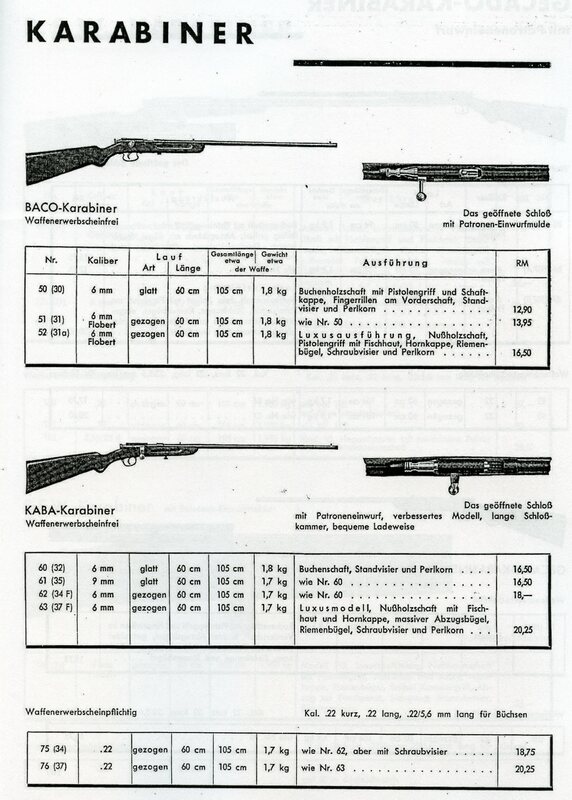 I assume that the Model 34 side by side shotgun was first offered for sale in 1934.